According to the letter of credit rules, the documents that reference to net weight or gross weight must not conflict with each other. Packing list and certificate of origin are two important trade documents. The packing list is a detailed listing of the contents of the shipment and acts as a supporting document. Along with a packing list and a certificate of origin, bill of lading, commercial invoice, weight list, inspection certificate, vessel certificate and insurance policy are the documents that are expected to contain a reference to the weight of the cargo. According to the latest version of letter of credit rules a data in a document must not conflict with, data in that document, any other stipulated document or the credit. As a result every gross weight and net weight values indicated on each document must be identical to one another. 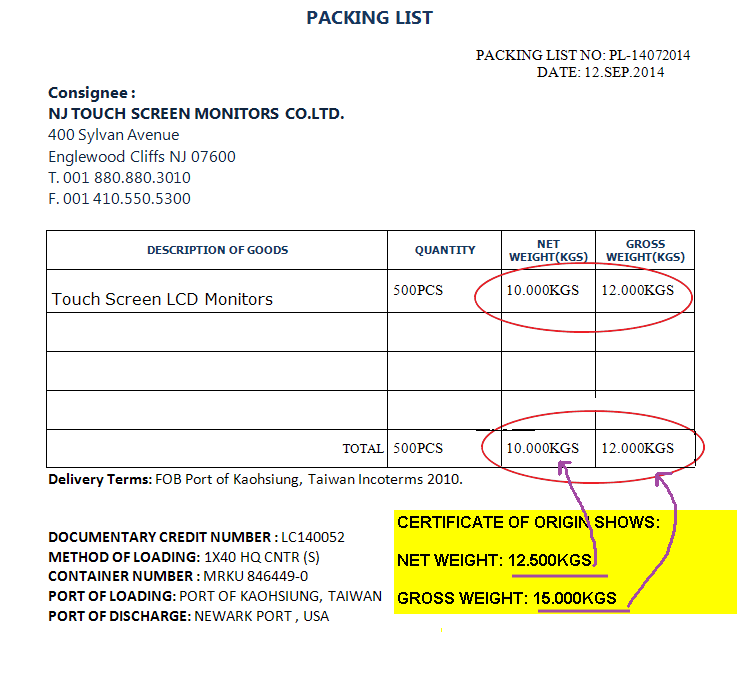 If the issuing bank finds out that the gross weight or net weight indicated on the packing list and certificate of origin do not match, then the issuing bank will raise a discrepancy, which is known as packing list and certificate of origin show different net weight or gross weight discrepancy. Field 45A: Description of Goods and or Services: 500 pieces of Touch Screen LCD Monitors. Delivery Terms: FOB Port of Kaohsiung, Taiwan Incoterms 2010. Signed commercial invoice in three originals and three copies indicating the L/C no. and contract no. 20140418. Certificate of origin in one original and one copy issued by chamber of commerce or any other competent authority. Packing list in three originals and three copies issued by beneficiary indicating quantity and gross and net weights. Full set 3/3 of clean on board ocean bills of lading marked “freight payable at destination” made out to order and blank endorsed notifying applicant with its full name and address. The beneficiary presented a Packing List as shown on the below picture. Discrepancy: The packing list states that “Net weight: 10.000 KGS” and “Gross Weight: 12.000 KGS”. On the other hand, the certificate of origin states that “Net weight: 12.500 KGS” and “Gross Weight: 15.000 KGS”. The packing list and the certificate of origin show both different net weight and gross weight. Reason for Discrepancy: According to the latest version of letter of credit rules a data in a document, when read in context with the credit, the document itself and international standard banking practice, need not be identical to, but must not conflict with, data in that document, any other stipulated document or the credit.